Kodak G4XL II Picture Kiosk Order Station - PFS / Photo Finishers Supplies Inc. The easy, affordable way to add the order taking capabilities of a G4XL II Kiosk to your Kodak APEX system or your digital Mini Lab. You can even add multiple order stations to your system for increasing order volume. Kodak’s award-winning kiosk software is designed to be truly intuitive. You get confident, satisfied customers that need less staff assistance. The G4XL II Order Station incorporates many options to maximize your profits like enlargements, photo borders, collages, photo IDs and more. Kodak Kiosks deliver beautiful and durable prints in just seconds. 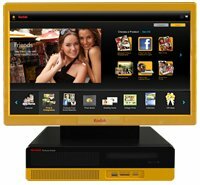 Exclusive Kodak perfect touch technology ensures better, brighter pictures. Make prints with rich vibrant colors, sharp details and fewer dark shadows. See the difference that consumers really value! The Kodak Kiosks offer many options and styles for creating custom calendars. Single sided calenders can be created in a variety of sizes, and the annual format features one photo and the monthly format features a new photo every month. With the Kodak Kiosk, your customers can design and print their own custom invitations, announcements and thank you cards, personalized with their photos and text. Double sided printing requires the Dl2100 Duplex printer. 8x10/12 printing requires an 8" printer. Creating Photo Books require a binding system. Print to print option requires the optional scanners.